​"Choral Society scales new heights"
A near capacity audience gathered in the Royal Hall to hear Harrogate Choral Society’s performance of Joseph Haydn’s ground-breaking oratorio ‘The Creation’. Composed at the end of the eighteenth century, the work depicts the creation of the world as described in the Book of Genesis and is generally considered to be one of the Austrian composer’s masterpieces. For its time, ‘The Creation’ was definitely forward-looking and offers many challenges for any ensemble tackling the piece. On this occasion, the combined forces of soprano, tenor and bass soloists, chorus and orchestra under the skilful direction of Andrew Padmore more than rose to that challenge in a performance characterised by energy, attention to detail and a sense of sheer musical enjoyment. The trio of soloists (who represent the archangels Raphael, Uriel and Gabriel and, later, Adam and Eve) were well-chosen, their voices perfectly suited to this music. The soprano soloist, Sarah Power, excelled throughout, mesmerising the audience with her impeccable phrasing, lightness of touch and technical prowess in a series of stunning arias and ensembles. Tenor Ben Thapa added a healthy touch of charisma to the role of Uriel, bringing an almost operative flavour to the role that did not seem out of place in a work that could almost be staged. Bass Miles Taylor grew in stature as the work progressed, his role requiring an extremely wide vocal range. There were some beautifully performed ensembles throughout the work with the duets between soprano and bass in Part 3 standing out in particular. The orchestra play a major role in ‘The Creation’, Haydn using the various instruments to give added emphasis to the setting of this colourful text, including the use of the contra-bassoon at the words ‘heavy beasts’ which is always guaranteed to amuse! In this performance, the Amici Ensemble played with a real sense of style and conviction. Particular mention must be made of some delightful playing by the woodwind principals throughout. Special praise though has to go to the Harrogate Choral Society who are to be commended wholeheartedly for singing the whole work from memory, no easy feat given the complexity of some of the choral writing. If there was the very occasional moment of slight insecurity, this was more than compensated by the tremendous sense of unanimity and sense of purpose of a choir singing without music copies, responding to their conductor’s every gesture and communicating with an audience who were hanging on to their every syllable! Overall, this was a splendid performance. The excellent programme note stated that the audience at the first performance in 1798 was spellbound. Over two centuries later, I think many of the Harrogate audience were too! Every year Harrogate Convention Centre fills with musicians young and old for The Christmas Event in Harrogate. Approximately 300 primary school children join forces with Harrogate Choral Society and Harrogate Symphony Orchestra in this family friendly concert. Every year there are three teams of children and there are so many schools in the district that each school will only perform at once every three years so this is a really special event for them. As usual this year there were special guests – the ladies choir Beati, and of course not forgetting the most important man of all at that time of year who we hope will be there in his red suit! ​"The traditional start to Christmas in Harrogate"
For many, the performance of Handel’s Messiah at this time of the year marks the start of the Christmas season. Certainly judging by the size of the audience at the Royal Hall that greeted Harrogate Choral Society at their concert on Saturday night, the work still retains a huge popularity among concert goers and the public at large. As usual, Andrew Padmore, the Music Director and Conductor showed a thorough preparation of the score attending to much detail and interpretation. The Manchester Camerata were in attendance and began with an excellent rendering of the Overture that opens the work. The dotted feature in the first section was generous and gently handled, the following allegro was brisk and decisive with excellent string playing. In fact the orchestral playing throughout the evening was quite superb and the players were obviously enjoying themselves. The soloists were well chosen by the Conductor, Jenny Stafford, soprano gave a good account of “How beautiful Are The Feet” and her earlier recitatives. Particularly good was “I Know That My Redeemer Liveth” which was sung with great feeling. Gaynor Keeble, mezzo-soprano sang beautifully throughout. “Behold, A Virgin Shall Conceive” and “O Thou That Tellest” were simply lovely. Cliff Zammit Stevens, tenor, sang with excellent diction, opening the evening with the recitative, “Comfort ye” and the aria, “Every Valley”, settling the audience and giving a quiet confidence to the evening. Alistair Ollerenshaw, baritone, gave an impressive rendition of both “Why Do The Nations” and also The “Trumpet Shall Sound”, accompanied with first-class trumpet playing from the orchestra. The Choral Society gave a truly excellent performance singing with tremendous energy and vitality. This was a much appreciated performance greeted with great applause at the end and an excellent start to the Christmas Season. ​"Singing under the beautiful Brangwyn Mosaics"
Harrogate Choral Society last visited St Aidan’s Church, Harehills, Leeds in December 2015 to sing Messiah and Rev. Andi Hofbauer was delighted to welcome them to sing again. The church is worthy of a visit in itself with the famous Brangwyn Mosaics as well as an impressive marble font and a confessional built by the mouseman Robert Thompson of Kilburn amongst the many impressive features. Messiah opens with an overture which was played by the choir’s very experienced accompanist Thomas Moore, who is organist at Wakefield Cathedral, playing the James Jepson Binns organ, an instrument of noted historic importance. The vocal performance was begun in great style by tenor Toby Ward’s rendering of “Comfort Ye “ and he continued in the same vein, later adding great pathos to “Thy Rebuke has Broken my Heart”. Bass Edward Seymour has a powerful voice and sang an authoratitive “Thus Saith the Lord”, and later on “The People that Walked in Darkness” and “The Trumpet Shall Sound” his rich voice resonating well throughout the whole church. The trumpeter in "The Trumpet shall sound" was one of the choir's youngest singers Ed Freeman, showing he can both sing and play! A family bereavement and illness meant that the Soprano and Mezzo soloists were actually last minute substitutes, but Helen Latham, Soprano and Amy Payne, Mezzo acquitted themselves well with some lovely singing. Of course the main performers were the choir themselves and Music Director Andrew Padmore, who guided them expertly through the many choruses - all of which were performed very well indeed. Having heard performances of Harrogate Choral singing Messiah with an orchestra this was a very different performance, somewhat slower as the organ cannot achieve the tempi of string players but most enjoyable. Of particular note were “Since by Man Came Death” and of course the “Hallelujah” chorus. The weather outside might have been cold, wet and stormy but inside the church the music was heavenly. "Launching the appeal to floodlight the Royal Hall and Cenotaph"
You know when you see Dame Fanny Waterman at a concert that some serious music making is about to happen and so it was last Thursday evening at the Royal Hall in Harrogate. On opening the very informative programme notes I realised that we were celebrating more than Parry, but also the Royal Hall’s Restoration Trust. The evening began with Edward Fox OBE talking about Parry’s connection with the Royal Hall and as the founder President of the Royal Hall Restoration Trust and fund raising for the proposed floodlighting of the Royal Hall Façade and the War Memorial in the centre of Town. We also had a note from HRH The Prince of Wales, patron of the Restoration Trust. He has been very much involved in the Royal Hall and officially opened the Royal Hall after its initial restoration in 2008. Singing tonight we had the Harrogate Choral Society and the Chapel Choir of Exeter College, Oxford. The orchestra was the Amici Ensemble, somewhat similar in its make up to Ripon’s St Cecilia orchestra. Both comprise professionals from larger orchestras and the local freelance community. Under the able direction of Andrew Padmore HCS’s Music Director, they were a delight to hear. Most of the works tonight were by Sir Hubert Parry and the evening commenced with both choirs singing ‘I was Glad’ now a perennial favourite and played at all royal weddings since Edward VII. We were really celebrating Parry’s connection with the Royal Hall 100 years ago and also the 100 years since the end of World War 1. I’m sure that most people would agree with me when I say that The Harrogate Choral Society is one of the most revered choirs in North Yorkshire and their performance tonight was no exception. We were shortly to discover how good were the tiny choir of Exeter College, Oxford who sang three more of Hubert Parry’s compositions exquisitely, unaccompanied; I was really impressed at their tonal quality, such a small choir under the direction of James Andrew Short, but they filled the Hall with their music. We then had the Amici Ensemble play ‘Hypatia’ incidental music by Parry in three movements, which was a great. After the interval Edward Fox OBE introduced the second half of the concert with HCS singing ‘Blest Pair of Sirens’ followed by the Amici Ensemble playing Severn Rhapsody by Gerald Finzi who used to be a Harrogate resident, I love his music. Back to ChapelChoir of Exeter College with three more Parry compositions,, again a delight to hear them. The Amici ensemble played a composition ‘Heroic Elegy’ by Farrar who has connections with Parry and Harrogate, he died tragically in September 1918 just before the end of the war, such a waste of talent. What could we possibly have as a finale on an evening celebrating Hubert Parry but ‘Jerusalem’ sung with great gusto by both choirs and most of the audience. A wonderful evening of memories and beautiful music. 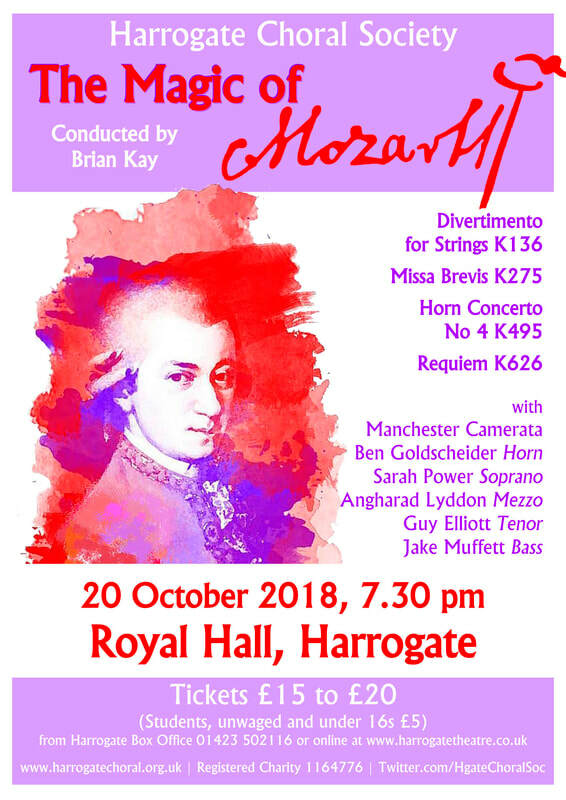 Harrogate Choral Society, together with the Manchester Camarata presented a fine evening of entertainment featuring music entirely by Mozart. This was a rather auspicious occasion as the Guest Conductor for the evening was Brian Kay who was celebrating his 30th Anniversary in his role as President of the Society. The concert supported the charity Disability Action Yorkshire whose aim is to facilitate solutions for disabled people whatever their aspirations might be and included, apart from the choral works two purely orchestral items one of which featured one of Mozart’s Horn Concertos with Ben Goldscheider as soloist on the French Horn. The concert opened with a performance of the Divertimento in D major K136, a very bright and cheery work scored for strings alone and part of what are known as the Salzburg Symphonies. Brian Kay conducted with delicacy, coaxing gentle and persuasive tone from the Manchester Camarata sometimes, in the echo passages taking the tone just down to a whisper. This was a beautiful and homely performance of this delightful work. There then followed the Missa Brevis K275, this being a rather less well-known work but very worthy of being included in this evenings programme. Here we were introduced to the fine quartet of soloists – Sarah Power, Soprano, Angharad Lyddon, Mezzo Soprano, Guy Elliott, Tenor and Jake Muffett, Baritone, who also sang the Intonations. The Choral Society sang with great clarity and the direction by Brian Kay was always gentle, encouraging engaging and carefully produced tone from his singers. Ben Goldscheider, a prize-winning instrumentalist on the French Horn was introduced to the audience by the conductor and continued to give a superb rendering of Mozart’s 4th Horn Concerto K495 accompanied with great sensitivity by the Manchester Camerata. Ben’s playing was full of exquisite phrasing and carefully graded dynamics. Although in this concerto the orchestra also contains Ripieno Horns, Brian Kay kept a gentle but strict control over the orchestra dynamic such that they never intruded upon the solo in any way but blended beautifully with the orchestral tone. Mozart’s Requiem Mass K626 formed the whole of the second half of the concert. This famous and heartfelt work has been interpreted in many ways and the large and appreciative audience not only had the chance to hear some excellent choral singing with many examples of light and shade, together with clear and precise enunciation of the words and fine tuning but also wonderful singing from the four soloists. Jake Muffett’s Tuba Mirum was full of warm broad tone with a lovely offering from the trombonist in the orchestra who later received a justified recognition from the conductor. The Recordare was especially well sung by the soloists. Angharad Lyddon’s voice was just lovely, a perfect and complimentary essential to Sarah Power’s delightful soprano offering while Guy Elliott completed the soloists with bright and superbly placed tone. This was an excellent evening of musical entertainment and first class in all respects. "A successful concert on an American Theme"
The final concert in the 2017-18 season for Harrogate Choral Society proved to be a great success. The venue was the church of St Wilfrid in Harrogate. With its impressive interior and splendid acoustics, St Wilfrid’s was filled to capacity by a very appreciative audience to greet the Society under the direction of its Conductor Andrew Padmore, with accompanist Thomas Moore, Director of Music and Master of the Choristers at Wakefield Cathedral, soloist Aofie O’Connell, Soprano and compere, Marilynne Davies. In recognition of Leonard Bernstein’s 100 Anniversary of his birth, the concert programme was all-American themed and began with a stirring rendition of America (My Country tis of Thee), the original American National Anthem to the tune of our own National Anthem. This was followed by Charles Ives Variations on America brilliantly played on the organ by Thomas Moore who brought out much of the humour of this composition. The main item in the first half was Bernstein’s Chichester Psalms, the Choir singing very confidently in Hebrew and Thomas Moore playing the tricky accompaniment with consummate ease. The treble solo was beautifully sung by young Charlie Trueman with an excellent quality that flowed like musical mist around and within the nave of the church. The second half featured the Choir in a rather lighter vein. With excellent performances of Samuel Barber’s Agnus Dei, Whitacre’s Seal Lullaby and O Magnum Mysterium by Lauridsen as well as Lullaby of Birdland. A Nightingale Sang was nicely sung by the group, Beati, but the star of this half was undoubtedly the guest Soprano Aofie O’Connell who delighted us with a selection of songs from musicals including the amazingly virtuosic Glitter and be Gay from Bernstein’s musical, Candide. Thank you to Andrew Padmore and all for this splendid evening of music. ​"Choral Society Celebrates 70 Years of Singing"
Harrogate Choral Society marks a huge milestone this year having presented concerts to the people of Harrogate and the surrounding district for 70 years. During this time, it has performed under many conductors who have contributed the talents of their professional work to furthering the important work of this most noble musical organisation. To begin the celebrations this year, the Society, under its Conductor, Andrew Padmore together with the Chapel Choir of Harrogate Ladies College with the Amici Ensemble presented a fine performance of Mendelssohn’s great oratorio, Elijah. A superb quartet of soloists graced the stage, Samantha Hay, soprano, filled the Royal Hall with most wonderful and expressive sound, her voice rising through and riding on the canvas of orchestral sound provided by the composer. This was just beautiful. Her rendering of ‘Hear ye, Israel’ for example, was just superb. Gaynor Keeble, mezzo soprano, sang with a voice full of the most delicious richness whatever the dynamic level. Her portrayal of Queen Jezebel was excellent, dark, sinister and vaguely unsettling, perfect for the character. Luke Sinclair, tenor sang with ease and great sincerity in his role as Obadiah, the servant of Ahab. His lyrical tenor voice was ideal for the Hall, floating with gentle but insistent intensity. Alex Ashworth, bass was a splendid choice for the role of Elijah. A demanding sing with much work to do throughout the evening. Alex did an excellent job maintaining the continuity of the story and portrayal of the character. Anna Staveley beautifully sang the part of the youth, looking out to sea awaiting the sign from God. ‘Lift thine eyes’ was beautifully sung by the Chapel Choir from Harrogate Ladies College, Director of Music, Kate Morgan who formed an important addition to the Choral Society for the evening. The Choir were simply splendid, supported by the Amici Ensemble who themselves were on top form with excellent playing in every respect. The Choir, and the all-important Semi-Chorus, sang with verve, passion and endless amounts of energy and they deserve tremendous praise for their efforts. Andrew Padmore, who conducted the evening with great energy and yet great sensitivity is to be thanked for this great evening of music from a composer who is arguably one of the greatest composers in this genre from the 19th Century. ​"Outstanding Messiah at Royal Hall"
The performance of Handel’s Messiah by Harrogate Choral Society is, for many people the beginning of Christmas in Harrogate and it must have been very gratifying for the performers, orchestra, singers, soloists and conductor to perform to an almost full Royal Hall. Equally gratifying was the standard of performance the singers and players gave to the audience. It was quite splendid with four excellent soloists, Bibi Heal, soprano, who sang with great breadth of tone and sensitivity both in the recitatives and her solos. ‘How beautiful are the feet’ and ‘I know that my Redeemer liveth’ were sung with almost heart-stopping beauty and with graceful phrasing and dynamic. Emma Watkinson, Mezzo Soprano, sang ‘But who may abide’, ‘O Thou that tellest’ and ‘He was despised’ with well-shaped and impressive drama, her voice full of well-controlled tone and delivered with musical excellence. Luke Sinclair, Tenor sang with a warm and rich voice delivering ‘Comfort ye’ with great musical comfort and ‘Every valley’ with wonderful vitality. This was confident singing which became even more convincing after the interval. Stuart Orme, Baritone was impressively persuasive in ‘Thus saith the Lord’ and ‘For behold. Behold, I tell you a mystery’ and ‘The trumpet shall sound’ demonstrated an commanding excellence of his art. Manchester Camerata which accompanied this performance were superb. Playing with sheer excellence, it showed a unanimity of musical thought which pervaded every part of this work. The phrasing was delicate and the cadences beautifully shaped. Andrew Padmore conducted with amazing energy, driving the choruses along at brisk tempo. The Choral Society were simply wonderful, dancing along the semiquavers with such ease and yet controlling the quieter passage with great control and feeling. This was an absolutely splendid and impressive Messiah of which the Conductor and performers should be very proud. ​"A Fine Evening of Musical Entertainment"
The Royal Hall, home to Harrogate’s Choral Society was well filled by a very enthusiastic audience for the Society’s autumn concert which took the form of a Gala Night of Opera. The Society under the baton of their Conductor, Andrew Padmore and accompanied by the Amici Orchestra presented a fascinating, varied and very attractive programme of operatic arias and choruses. The Choral Society and Orchestra began with the Procession and Chorale from Die Meistersinger by Wagner, the Society in excellent voice and the Orchestra in fine form. This was followed by a chance to listen to the ladies of the choir producing very fine tone in the Chorus of the Peasant Girls from Eugene Onegin by Tchaikovsky. Andrew Padmore’s choice of soloists for the evening couldn’t have been better, Sarah Fox, soprano, brought the delights of her voice in the Recitative and Aria, Dove Sono from Mozart’s Marriage of Figaro and in Dido’s Lament from Dido and Aeneas by Purcell, the latter sung with much beauty and pathos. John Cunningham, bass baritone, brought a rich and resonant voice to the evening, ideally suited to the surroundings. The Toreador Song was splendidly sung with great verve and panache following which John sang the utterly beautiful O pure and tender Star of Eve from Tannhauser by Wagner with great sensitivity and grace. ​The two soloists joined in the ever popular La ci darem la mano by Mozart with just a little acting to make it most effective. The Choral Society, together with members of the Halcyon Singers sang very well indeed – really well with excellent tuning and tone in all voices and the accompaniment from the orchestra was always superb. Marilynne Davies compered the evening with great aplomb and relaxed humour. A fine evening of musical entertainment.